Layered Tomatoes and Cucumbers is the perfect side dish that takes just 5 minutes to make. Thinly sliced fresh cucumbers and tomatoes drizzled in a homemade dill vinaigrette! It's still summer for a little while longer! Our garden is producing the most amazing and abundant produce. This year, we have sweet peppers, cucumbers and tons of tomatoes. It is our first year growing roma tomatoes and I am so glad we did. We always can a bunch of homemade salsa and pasta sauce and it is difficult to cook all of the extra juice out of the tomatoes. I decided to grow roma tomatoes because they are not as juicy making them better for sauces. They are doing so well and taste amazing too! Much better than anything you can buy in the store. My father-in-law went to our local large farmer's market and had an extra cucumber plant that he didn't need. He offered it to us and of course, I took it. I don't turn down produce, ever! Well, the plant went crazy and we have cucumbers coming out of our eyeballs pretty much. We went away for a weekend and came back to about 10 giant cucumber that were ready to be picked. That is where this recipe comes in. I had tons of tomatoes and cucumbers to use up and made this dish in quite literally 5 minutes! It is so much prettier than chopped up cucumbers and tomatoes and tastes amazing too! I just thinly sliced tomatoes and cucumbers and drizzled on quality olive oil, vinegar, salt, pepper and freshly chopped dill. Try it! It is simple yet delicious. The inspiration for this recipe came from my post popular recipe on the blog ever (it has about 10x the traffic of my second most popular post to give you an idea): Parmesan Tomato Zucchini Bake. I piggybacked off that idea and came up with this recipe, no oven required. Feel free to switch up using whatever herbs you have on hand as well. This recipe would be amazing with some grilled, marinated chicken on a hot summer day. It would pair well with the Cambria's Benchbreak Chardonnay and Cambria's Benchbreak Pinot Noir. I'm thinking of dining outside with this simple meal and wine would be the perfect end of summer celebration! These wines are grown and bottles in California. I have had Cambria wines before and they are delicious. 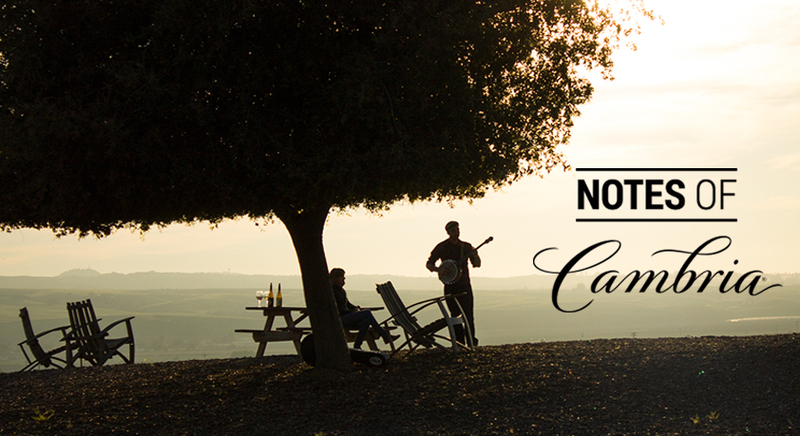 Cambria recently did something awesome: they challenged a musician to make music that was inspired by their wines. They made a Pinot Noir Waltz and a Chardonnay Shanty. I love watching the video about the wines because they show the amazing vineyards which are always breathtaking to look at. These musical pairings are a new approach to help you experience, learn and talk about the wine! Can I come to the Cambria vineyard and listen to these songs live?? I'll be there in a minute! 1. Layer cucumbers and tomatoes in a square or rectangular dish. 2. Whisk together the rest of ingredients for vinaigrette and pour over stacked vegetables. Find out where Cambria wines are sold using this store locator and check out the Notes of Cambria series above (it is 4 parts all about the wine! ).